Out in Istanbul’s Eyup neighborhood is Isfanbul (formerly named Vialand), a massive theme park complex replete with roller coasters, adventure rides, interactive activities, and more. Vialand also contains a luxury hotel, shopping malls with more than 250 stores, myriad restaurants, a cinema, a games center, and an open-air performance venue. Isfanbul is designed to have attractions that are suitable for all ages, from very young children to older kids and adults. International brands have stores in the malls at Isfanbul, and cartoon character mascots wander the park. Some areas of Isfanbul are modeled on iconic European cities, including Venice. Some private Istanbul tours visit Isfanbul and include admission tickets as well as round-trip transportation from Istanbul hotels. Isfanbul is a must-visit for adrenaline enthusiasts. The theme park is a great place to visit with children, as there are kid-friendly activities and rides for all ages. Isfanbul is not accessible to wheelchair users. Free shuttle buses to Isfanbul are available for visitors staying in the Sultanahmet neighborhood. There are also city buses that go to Isfanbul, and you can also take a taxi. For maximum convenience, choose a tour that includes round-trip transportation. The Isfanbul theme park is open from 10am to 6pm Tuesday through Friday and to 8pm on weekends; it is closed on Mondays. The attached malls are open every day. The theme park gets busiest during afternoons, weekends, and school holidays; plan your visit accordingly if you want to avoid crowds. Turkish holidays can affect opening hours, so make sure to check ahead of time. 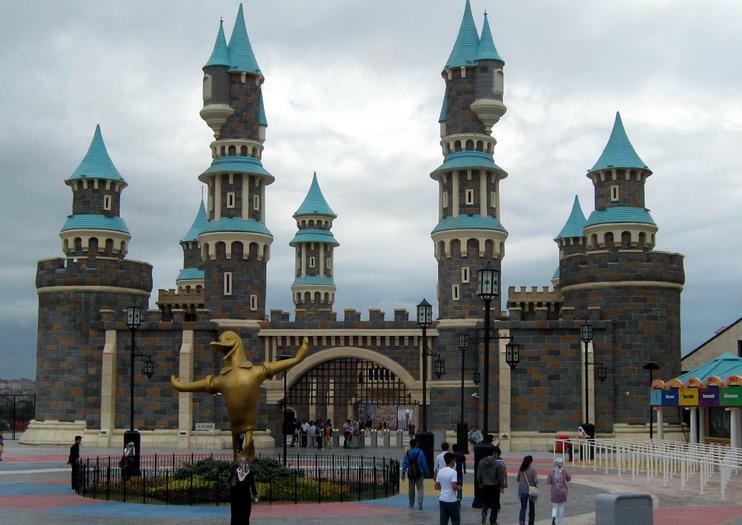 The massive theme park at Isfanbul contains many rides and activities for all ages. The Breath Taker roller coaster is designed for speed and thrills, hitting speeds up to 68 miles (110 kilometers) per hour. Wild River is an adrenaline-filled water adventure ride, while the Justice Tower swiftly drops brave riders 165 feet (50 meters). Younger children enjoy the carousel and mini cars, as well as the playgrounds that dot the park. Enjoy an adrenaline kick, a shopping fix and non-stop entertainment with an action-packed day out at Vialand theme park, including admission tickets and round-trip transport from Istanbul. With a theme park, shopping mall and entertainment complex, there’s no chance of being bored at Vialand. Test your nerves on the Breath Taker rollercoaster, treat the kids to a cruise down the lazy river, then max out your credit card at shops like Armani, H&M and Tommy Hilfiger. That’s not all: there’s also a multiplex cinema, bowling alley and food court. Celebrate your inner kid or spend a fun day with the family on this full-day private tour of Vialand and Jurassic Land in Istanbul. In Vialand you can chose from a variety of activities for all ages including bowling, movies, shopping, playgrounds and roller coasters. Jurassic Land will transport you back in time to the age of the dinosaurs with 70 life-sized moving models, a 4D cinema and numerous skeletons, eggs and visuals. Lunch is included in the tour and a private guide will be on hand to offer a more personalized experience. Don’t miss this chance to have fun with the family and explore the two biggest them parks in all of Istanbul.